Breaking an almost 23-year hiatus, legendary singer Asha Bhosle has recorded a Bengali song on the occasion of Durga Puja. Asha, who recorded as many as 66 Bengali Puja songs including singles and duets for late composer-husband RD Burman over the years, has come up with her latest release "Ebar Pujoy Elaam Phire". The song, released on October 8, is a part of the album "Pujoy Asha". Famed playback singer Amit Kumar has also lent his voice to the album with "Surey Tumi". Kolkata: Breaking an almost 23-year hiatus, legendary singer Asha Bhosle has recorded a Bengali song on the occasion of Durga Puja. "Working with Ashaji is a dream come true. Almost after 23 years, she has lent her voice to a Bengali Pujo song. It took time to convince her as she had stopped singing Bengali Puja songs after Pancham da's (R.D. Burman) death," Shiladitya Chaudhury, one of the composers of the album, told IANS. The genre of Bengali Puja songs refers to those albums released ahead of Durga Puja - West Bengal's biggest religious and cultural carnival. Old timers turn nostalgic at the very mention of these songs which had their golden period from the 1960s to a few years back. The extremely popular genre was almost synonymous with greats like Asha, Lata Mangeshkar, RD Burman, Hemanta Mukhopadhyay, Manna Dey and Kishore Kumar. The Bengali Puja songs are very close to Asha's heart, Chaudhury said. "Aamar Khatar Patay" released in 1963 was Asha's first Puja song, which was composed by Manna Dey. 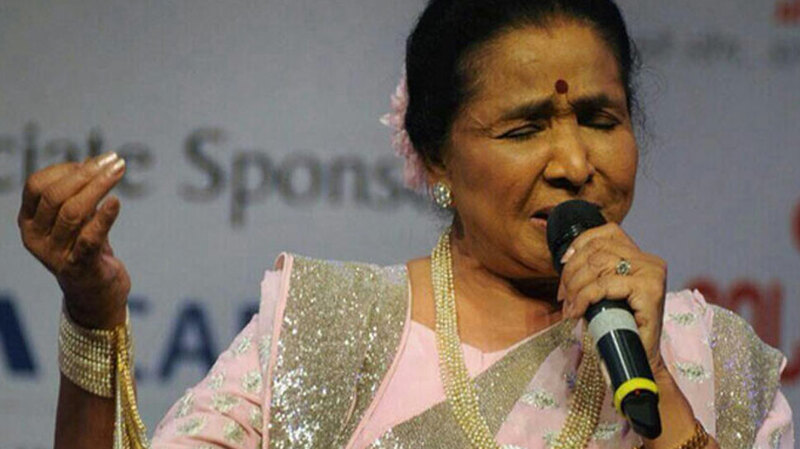 But it was 50 years back in 1968 that she sang her first puja song that was set to tune by Burman. "Eyi Edike Esho" and "Jabo Ki Jabona" were penned by Gouriprasanna Majumdar. There were subsequent blockbusters like "Durge Durge Durgotinashini" and "Moyna Bolo Tumi Krishno Raadhe". The song "Ebar Pujoy Elaam Phire" was recorded by Asha exactly a week after she completed 85 years. "While recording the song she recalled her days with Pancham da. She was happy that even after so many years people want to hear her Puja song," said Chaudhury. Raj Roy is the co-composer, and Utpal Das is the lyricist. With "Surey Tumi", Amit Kumar has recorded a Puja song here after 14 long years. He recorded his first such song under the baton of his legendary father Kishore Kumar in 1973 and the songs "Jinisher Daam Berechhe" and "Mone Mone Kotodin" were huge successes. The song, released on October 8, is a part of the album "Pujoy Asha". Famed playback singer Amit Kumar has also lent his voice to the album with "Surey Tumi".